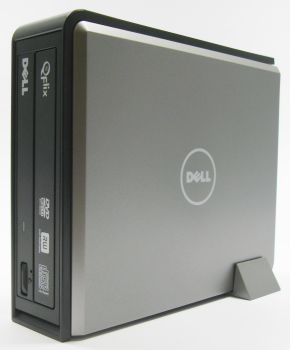 The first Qflix-enabled DVD burner has hit the market and surprisingly, its from Dell. I have no idea who's manufacturing it but if I had to guess, its Lite-On or Pioneer. Dell and Sonic Solutions have teamed to make downloading and recording DVD movies easy with the first PC-based Qflix™ drives. Using an intuitive application, Roxio® Venue, movie collectors can search and select from a variety of major Hollywood hits available from CinemaNow, download them on their PC, transfer them to multiple digital devices in their home, and then create a permanent and portable DVD-format copy on Qflix DVD media. The Qflix drive bundle is available in the U.S. today as an option on most Inspiron, Studio and XPS laptops for $120, as well as through Dell’s Entertainment, Software and Accessories online store, and will be available soon as option on select consumer desktops. The bundle includes an external Qflix-enabled drive, which also supports standard DVD read/write functions, two recordable Qflix DVD discs, Roxio Venue and CinemaNow software and a USB cable. The price will have to come down A LOT before I'd invest in a Qflix drive. I just can't bring myself to spend $120 on an external writer that, without Qflix, would cost half that. Figure in the cost of the download as well as the special Qflix media and you're almost better off buying a physical copy of the movie. Here's a closeup of the front. I still can't tell who makes it. Looks like a Lite-On case design though. For those wondering, its based on the Lite-On DX-20A6Q.